GMP (Good Manufacturing Practice) defines guidelines for quality assurance and has been interpreted differently for different industries (mainly pharmaceutical products and ingredients, cosmetics, food). Especially in the pharmaceutical industriy, compliance with the guidelines is binding throughout the whole supply chain. EU and FDA (the American Food and Drug Administration) guidelines refer to GMP standards. Therefore the equivalent GDP (Good Distribution Practice) standard has been defined for distribution of pharmaceutical products. It specifies guidelines for sale, distribution, logistic, transport and storage of such products and can be adopted both completely and for particular elements in the supply chain, e.g. stock and/or transport companies. Rhein S.Q.M. 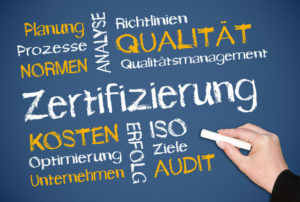 has many years of experience in the pharmaceutical industry and can offer a comprehensive certification service, incl. manual, process and work instructions, risk analysis and HACCP hygiene management, equipment and standards for product and process monitoring, CAPA management and coordination with accredited GMP certification bodies, which also provide GDP assessments. The implementation of a practical and business-oriented system will safeguard compliance with all requirements..
We help your company to open lucrative business doors by ensuring compliance with GMP / GDP requirements. Get qualified for the international pharmaceutical industry and trade!